Ever felt this urgent need to go somewhere else than your desk at uni, but felt guilty the moment you decided to stay at home? Ever experienced this status of being extremely demotivated in a time when you can’t really afford to be lazy and you needed a motivation boost? Sounds familiar to you? This is one of the very normal phases every postgraduate student lives through sooner or later – we decided to find a way to quit this endless loop! Our solution: pack your mates, grab your laptops, turn your phones off and go somewhere else! 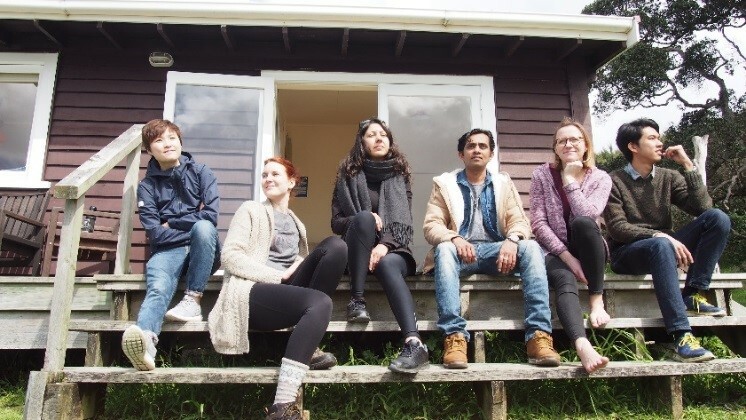 We (six PhD students from the School of Hospitality, Tourism and Events) organised a little Write Away, rented a cottage in Scandrett Regional Park – only one hour north of Auckland – and started the experiment! After a little kick-off and goal setting session the Monday prior to the trip, everyone had a mission: writing a thesis chapter, conceptualising the research design, reading particular articles, and so forth. The excitement of the unknown translated into a motivation that became tangible and drew everyone to the table from the second we arrived. From time to time the views didn’t make it easy to stay inside, but the dynamics in the group (and potentially the very unpredictable weather), kept everyone inside without feeling caged in. But we didn’t only come to be productive 24/7 and continue our everyday rat race; we also wanted to create stronger bonds. Think about it: You might know your mate’s PhD topic and the method(s) he or she is applying, but what do you know about the person behind all this? You spend a lot of time with these people, but barely know whether they have siblings! What are their hobbies and what is their favourite movie of all time? We wanted to overcome this anonymity – the elephant in the room – and get to know the person behind the PhD student. In between writing, we had Walk & Talk time to enjoy the scenery and chat about anything and everything. We prepared our meals together and played some card games. Sounds like a great holiday, eh? – but a productive one! Do you want to hear what’s even better? Because we are a peer mentoring group through the Graduate Research School, we were lucky to get some funding to go towards our grocery shopping – perfect to supply our breakfasts and pizza nights! After very successful 2.5 days of writing, we decided to treat ourselves – the grand finale of our first PhD Write Away was a 90 minute relaxation yoga session followed by a short dip in a spa somewhere in the nowhere – a trip almost couldn’t finish better than that! Just see what the others have to say and follow our advice: Pack your bags and Write Away!! 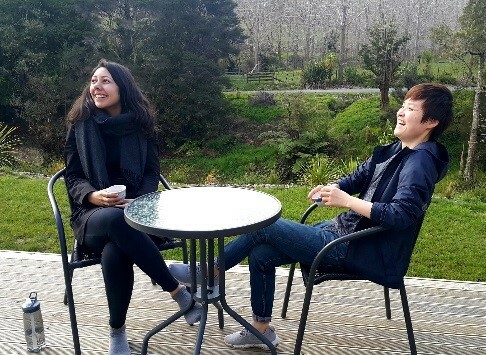 Chantal: At first, being enclosed in a bach, together with 5 other people in the middle of nowhere sounded like the ultimate introvert-nightmare, but turned out to be the best two and a half days since my arrival in Aotearoa two months ago. I’d be happy to return for the summer months, having a BBQ outside while discussing critical aspects of my then upcoming PGR9. Sarath: It’s one of the unforgettable events in my PhD journey. Despite it being more of a casual event, we managed to make it very much value-adding to our individual journeys. I really enjoyed working in more social and fun-filled way close to splendid nature. 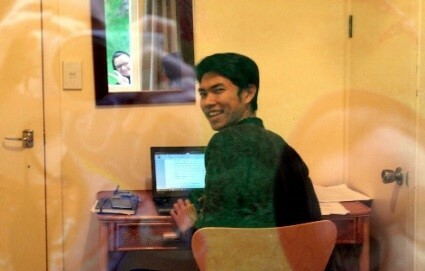 PhD students, unwound, and recharged my body and mind. Would definitely repeat it again! 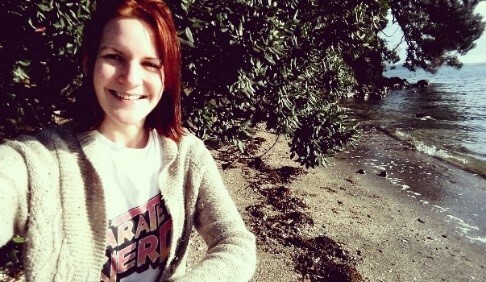 Blake: It is so good to have a break out of the routine at a beautiful beachside. Reading and writing at a large table or a cosy sofa; thinking while standing on the soft sand; talking with my mate in a shed in the heavy rain; all these just refresh my mind and restore my confidence in my research. And two wonderful nights of cooking and chatting, we get to know each other as so much more than just colleagues and peers. Thanks for this Write-Away. Richard: Everything about our Write Away – the off-the-beaten track location, amazing views, hearty home-cooked food, and fantastic bunch of like-minded people – is perfect to get two weeks’ worth of work done in a fun and social way! The scenic and encouraging atmosphere makes a good recipe for a refresher within the journey called ‘PhD’. I encourage you to pack your bags, leave your desk, grab you peers and go Write Away! Sabrina: This might have been the first PhD Write-Away, but I am sure not the last! When it was time to pack up, I had this feeling that you normally only get when you are on vacation: I wanted to stay! There were so many ideas still in my head, the short getaway definitely stimulated and motivated me for the upcoming weeks! Sabrina Seeler is a PhD student at AUT's School of Hospitality and Tourism. She is the co-leader of the School's Doctoral Tea Party group, and organiser of the Write-Away retreat. What’s the Deal with the Provisional Year Review? What a great idea! 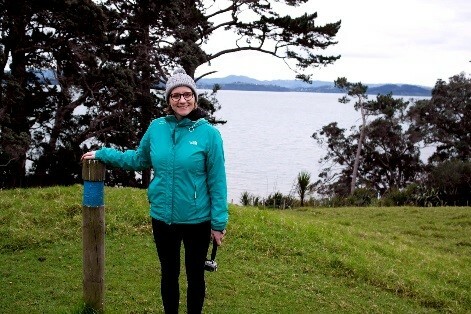 I am a part-time distance student from the Bay of Islands and meeting up with other PhDs is difficult for me. Any chance of someone from another School joining in the next Wright Away that is held?